Fair. Slightly grubby for its age. Parchment : 8 sheets 23cm x 28cm with 10 wax seals and duty stamp. Includes plan of property. Thomas James Mullineux of Liscard, Cheshire. Farm Labourer. David Evans Mullineux of Egremont, Cheshire. Butcher. John Hindley Mullineux of Egremont, Cheshire. Butcher. William Hindley Mullineux of Liscard, Cheshire. Plasterer. Joseph Ezekeil Mullineux of Liscard, Cheshire. Plasterer. Alfred Ezekeil Mullineux of Liscard, Cheshire. Stonemason. Mary Jane, the wife of Alfred Walley of Liscard, Cheshire. Bricklayer. James Mullineux of Liscard, Cheshire. Gentleman. Frederick North of Liverpool, Lancashire. Gentleman. The indenture concerns a piece of land totalling 2900 square yards on the East side of the Sea View Road, Liscard, Cheshire. It is to be divided into 7 parts for the various members of the family. 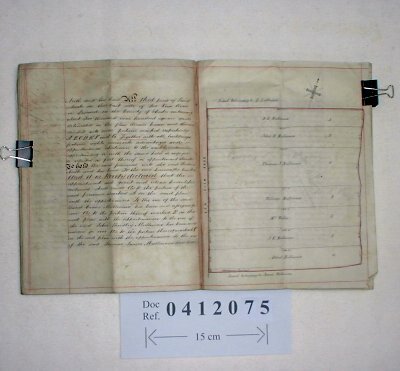 The document begins by reciting the will of Thomas Mullineux of Liscard, Yeoman (dated 1847) which left this property to his son James Mullineux and son-in-law, Joseph Kitchin, in trust for the use of his son John Mullineux. John Mullineux died in 1876 leaving 8 children (6 sons named as parties to this deed, and 2 daughters, Mary Jane and Eliza Ann). Eliza Ann married Charles Harris and died in 1877 with no surviving children, with her share of the estate passing to Thomas James Mullineux. After the partition, it appears that the whole property is sold (?) or leased (?) to Frederick North.